Fruit Twist is here! Fruit Twist is part of the Lemon Twist & Melon Twist family made by Daddy’s Vapor. Fruit Twist Tropical Pucker Punch offers an incredible flavor that will send your imagination to far away beaches soaking in the sun! 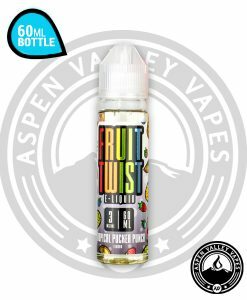 If you are a fan of Fruit Flavored E-Liquids then you MUST try Fruit Twist! Grab your 60ml bottle today and go on a mini vacation any day of the week! Fruit Twist Flavors: Tropical Pucker Punch.